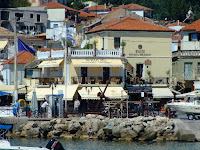 Situated just to the left of the jetty on the main harbour Rudis commands a great view of the bustle of life in the centre of the waterfront of Parga, especially as the seating is either on the first floor with several settings available out on the balconies, or there is a further roof terrace available up another level. For some this location may be seen as a problem as the open space in front of the jetty is the customary playground for the kids in the afternoon and evening so there is a fair amount of noise. This restuarant is again a little more upmarket than the competition of the harbour front and the menu lives up to the lovely location and decor. I started with a deep fried cheese in Blackberry sauce and followed it with an excellent Duck in orange sauce, while my wife had the mushrooms ala creme and a Lamb fillet with sun dried tomato. There's the traditional greek favourites on the menu too together with several pasta dishes which had tempted me too. All the dishes we had were prepared to a superb standard and we both could easily say it had been the best meal we had had all holiday. Together with a bottle of the Rose Boutari the meal came to €55 so the prices of Rudis, Castello and Kastro all seem comparable. Heartily recommended and had we not only tried this place on our second to last night we would have definitely gone back for a second try.